Ruins at Mahabalipuram, India, both on and off shore. Don’t be thrown by the word “Atlantis” in the title. The origin and history of humankind is so much more rich and exciting, so much more intriguing and fascinating than what mainstream science would have us believe. There is biblical and scientific evidence supporting the massive flooding of coastal civilizations at the end of the one and only Ice Age that was caused by Noah’s Flood. 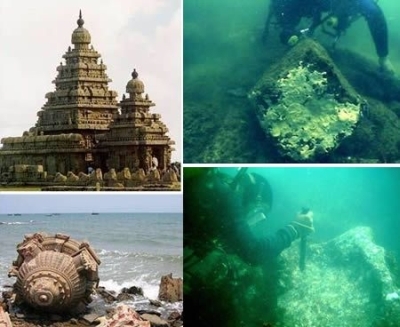 Underwater ruins of flooded kingdoms have been found all over the world but these finds are ignored and left uninvestigated by mainstream science. Why? I credit Graham Hancock, who is in this film, and his diligent research with making this alternative history accessible to us. He was the one, many years ago, who sparked my interest in these things. 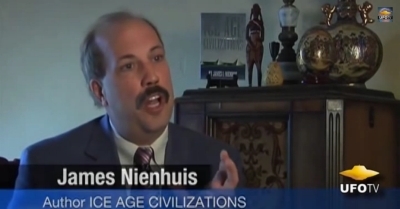 However, as you watch this film, pay particular attention to the comments of James I. Nienhuis (bio) He is a Christian researcher and founder of Genesis Veracity Foundation. As far as I’m concerned, he’s solved the mystery of why and when the ancients built megalithic civilizations all over the world. Regarding Atlantis, he contends that Plato made an error and used a date of 9,000 solar years before his time when recording the story per the Greek Calendar rather than 9,000 lunar cycles which was the calendar the ancient world was accustomed to. Dating Atlantis according to 9,000 lunar cycles would put the rise of this civilization squarely within the time during the last Ice Age happening right after Noah’s Flood when all of these other civilizations thrived as well. And I must add, just because this is a UFOTV production doesn’t mean I support the idea that there are accounts of UFOs in the Bible so please don’t send me comments or emails about that. And I know Mr. Nienhuis doesn’t either so you can relax. I also don’t agree with everyone in the film, particularly the guy talking about vortexes. Sometimes, to get at the truth you have to spit out the bones. Let’s break it down, simply. “In this catch twenty-two situation, mainstream scientists are forced to either disavow the submerged megaliths, or say that they were built before 10000 B.C. Obviously, neither is a palatable choice for the defenders of the archeological status quo, because these same defenders of orthodox dogma correctly note that megalithic-building civilizations like Egypt, Sumer, and the Indus-Sarasvati sprang up quickly at around 2000 B.C., although they would probably say closer to 3000 B.C., and so, these defenders of the archaeological status quo have also highlighted the contradiction between the orthodox date of the end of the Ice Age at around 10000 B.C., and their acknowledged date for the sudden appearance of megalithic building at circa 2000 B.C. (back to 3000 B.C in their book). If mainstream science accepted alternative history starting with the existence of these flooded civilizations, it would be forced to admit humans were advanced as they are today (probably more so) earlier than 10,000 BC when we were supposed to be living in caves using primitive stone tools. In other words, this doesn’t fit their paradigm and they would be forced to admit they were wrong. Furthermore, even though the Bible tells us the earth is only 6,000 years old, accepting this alternative view would still lend support to the biblical truth that all of these civilizations copied one archetypal or source-civilization – Babel – and that humans were always as intelligent as they are now, but only with a different body of knowledge resulting in a different culture. Mainstream science can’t concede that ground. If mainstream science accepted biblical history, in addition to the above, it would be forced to admit that the Ice Age was much later, only slightly earlier than 1,500 BC, and that brings it perilously close to discovering the cause which would be Noah’s Flood. This, of course, would support the account of history we find in the Bible. And again, accepting this biblical view would support the biblical truth that all of these civilizations copied one archetypal or source-civilization – Babel. Mainstream science certainly can’t admit to a global flood. It would be helpful to read through the story of Babel to pull all of this together. The people at Babel built a ziggurat/pyramid to the stars based on an advanced knowledge of astronomy. When they were dispersed, the respective people-groups took that knowledge with them to wherever they went and proceeded to build similar megalithic structures with similar purposes. This is what mainstream science, and even alternative history, is afraid to admit. The practice of megalith building (based on advanced astronomical knowledge which allowed the ancients to circumnavigate and map the earth) and the similarities in myths and religions between all of these people-groups can be traced back to a single source – Nimrod and the Tower of Babel – and I would submit also the time right before the Flood when the Fallen Angels came down and interacted with humankind. I would expect Noah’s grandchildren to ask him and their fathers questions about the time before the Flood, children being curious. Some of these stories based on actual events undoubtedly turned into mythologies and religions as did some of the events during Nimrod’s kingdom and also during the beginnings of the peoples’ respective kingdoms when they were being established after the dispersion. Consider, none of these megalithic ruins that are being found are likely to be older than 2,348 BC, the date of Noah’s Flood. Artifacts? Maybe. Cities? Probably not. This also means that when archaeologists attach dates to things that fall before this time, the dates are wrong. And that means the dating methods are suspect at best. Consider, it’s absolutely fascinating that God was bringing Israel out of Egypt as the Ice Age was ending! God brought them to a lush land to flourish and removed them to their own land when Egypt started to become dry and parched. Also, consider that alternative history is at least on the right path to confirming biblical history and so should not be discounted by Christians. Just make sure you study it with your Bible glasses on as sometimes dates and motivations are wrong. There are many other films I wish to share with you in the future, but I posted this one first so you can be somewhat grounded in biblical chronology before I post the others.